David Pagnotta: Scouts listed to attend last night’s Leafs-Ducks game: Carolina Hurricanes (3), Columbus Blue Jackets (2), Florida Panthers (2), New York Rangers (2), Montreal Canadiens (2 – including GM Marc Bergevin), Dallas Stars, Vancouver Canucks, Vegas Golden Knights, and the Winnipeg Jets. Chris Johnston: Canadiens GM Bergevin was also in Winnipeg to watch the Ducks on Saturday. Mark Stepneski: Scouts listed to attend last night’s Stars-Coyotes game: St. Louis Blues and the Montreal Canadiens. Adam Kimelman: Scouts listed attended last night’s Flyers-Canucks game: Florida Panthers, Carolina Hurricanes, New Jersey Devils, Boston Bruins, Vegas Golden Knights, Calgary Flames, Montreal Canadiens, and the Detroit Red Wings. 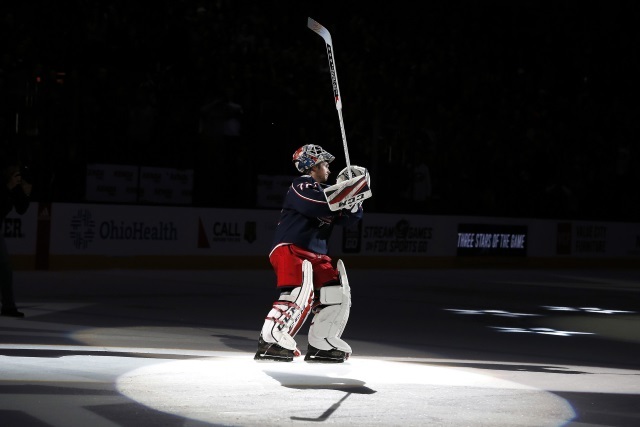 Larry Brooks: The Florida Panthers are interested in trading for Columbus Blue Jackets goaltender Sergei Bobrovsky and then hope that he’s interested in signing an eight-year extension with them. Derick Brassard would likely be part of the package going back to Columbus. Jimmy Murphy: Two sources have said that the Panthers tried to acquire Bobrovsky at the draft last year. The Panthers had looked at Boston Bruins Tuukka Rask on several occasions. George Richards of The Athletic: Derick Brassard has only played one game and had one practice, but he wouldn’t mind staying. Then there was Larry Brook’s tweet today (noted above) involving the Blue Jackets and Bobrovsky. Panthers GM Dale Tallon does have the assets to land Bobrovsky if he wants to take a run at him.